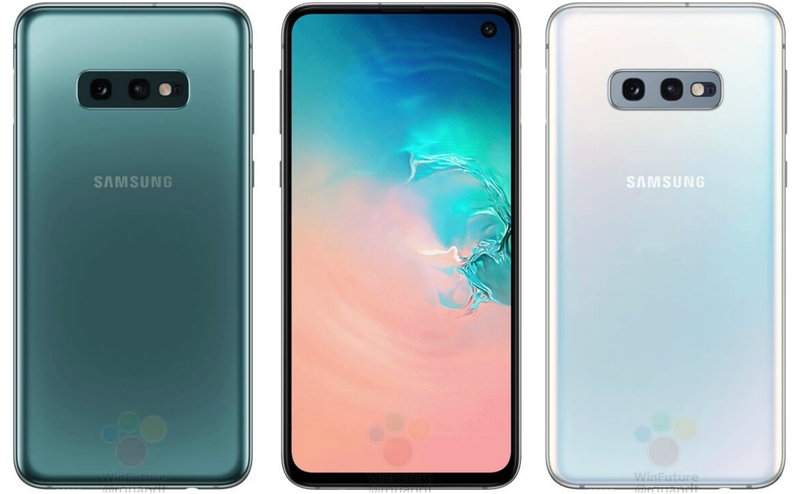 A week is now left for the launch of much awaited Galaxy S10 Lineup that includes three phones – the Samsung Galaxy S10, Galaxy S10+, and Galaxy S10e. So far, we know every bit of detail regarding the design, thanks to all the previous leaks. 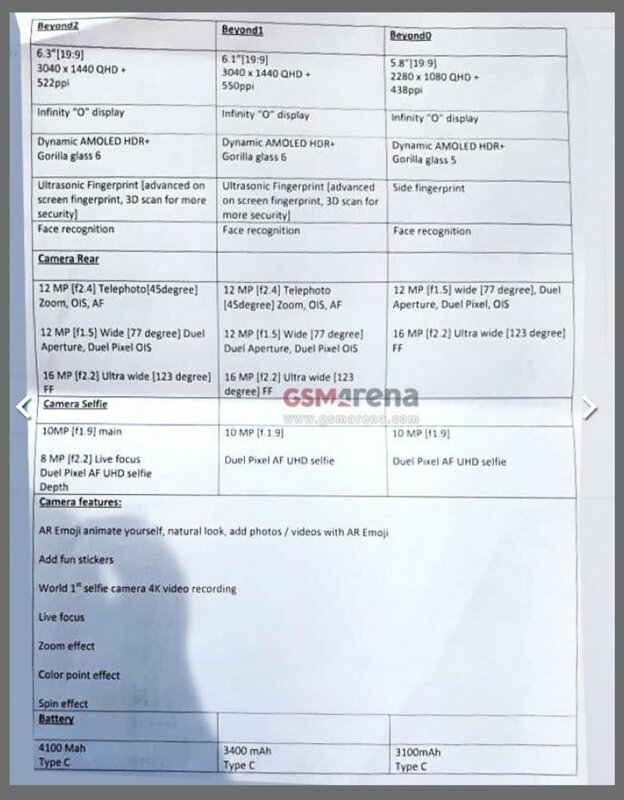 Today, the full spec sheet of the Galaxy S10 trio leaked that revealed all the specifications and also confirmed some that we already know. 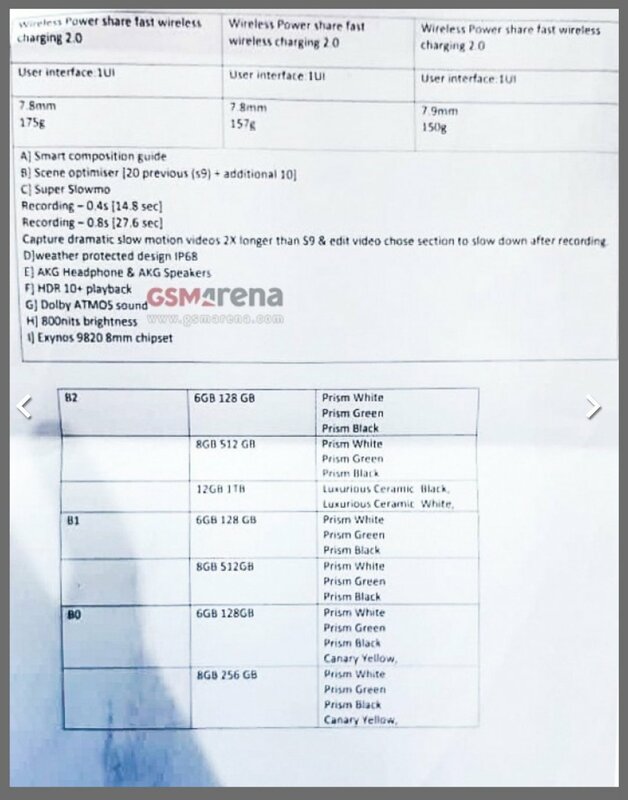 This latest leak comes from GSMArena that got these exclusive specs via an anonymous tipster. 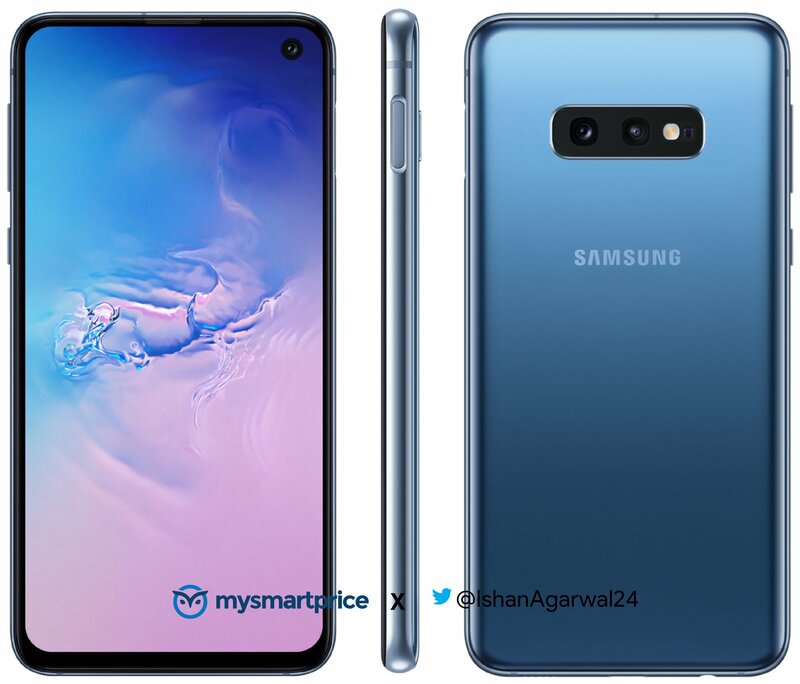 If you don’t know, the Beyond 0 is Galaxy S10e, Beyond 1 is the Galaxy S10, and finally, the Beyond 2 is the Galaxy S10+. As the image above reveals, the Samsung Galaxy S10e has a 5.8-inch 19:9 Infinity-O display with a resolution of 2280 x 1080 pixels. The pixel density is 438ppi. The Galaxy S10, on the other hand, has a 6.1-inch 19:9 Quad-HD+ Infinity-O display with a resolution of 3040 x 1440 pixels. The pixel density is 550ppi. Finally, the Samsung Galaxy S10+ has a 6.3-inch 19:9 Quad-HD+ Infinity-O display with a resolution of 3040 x 1440 pixels. The pixel density is 522ppi. All the three phones have Dynamic AMOLED HDR+ displays with Corning Gorilla Glass 6 protection and 800 nits maximum brightness. The Galaxy S10e comes with a side-facing fingerprint scanner while the S10 and S10+ have an ultrasonic fingerprint scanner under the display. Also, all three phones feature Face Unlock. The 8nm Exynos 9820 powers the Samsung Galaxy S10, S10+ as well as the S10e. So, there is no compromise when it comes to the processor. 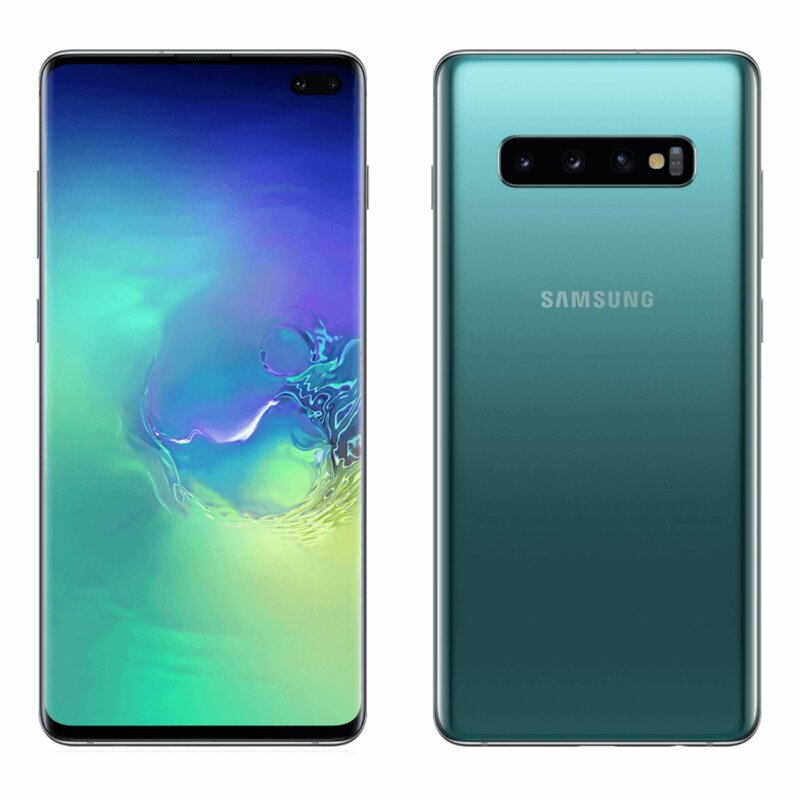 Coming to the cameras, the Samsung Galaxy S10e has a dual camera setup on the rear that includes a primary 12MP camera with a dual aperture (F1.5 and F2.4), Dual PixelAutofocus & Optical Image Stabilization, along with a secondary 16MP Ultra wide-angle camera (123-degree) with f/2.2 aperture. Both the Galaxy S10 and S10+ have triple rear cameras, and both have the same camera arrangement. So, there is a primary 12MP camera with a dual aperture (F1.5 and F2.4), Dual Pixel AF and OIS, a second 12MP telephoto camera with f/2.4 aperture & OIS, and a third 16MP Ultra wide-angle camera (123-degree) with f/2.2 aperture. On the front, the Galaxy S10 and S10e have a single 10MP f/1.9 camera with Dual Pixel Autofocus. The Galaxy S10+, on the other hand, has dual front cameras which include a primary 10MP f/1.9 camera and a secondary 8MP f/2.2 depth sensor with Dual Pixel AF. Some camera features include Scene Optimizer (10 new Scenes), Super Slowmo, Dramatic Slow Motion video, AR Emoji, Stickers, 4K video recording with the Front camera, Live Focus, etc. The Samsung Galaxy S10e has a 3,100mAh battery, the S10 has a 3,400mAh battery while the Galaxy S10+ has a 4,100mAh battery. This makes the Galaxy S10+ the phone with the biggest battery in Samsung’s flagship lineup. All the three phones have USB Type-C port and support Fast charging as well as Wireless charging. Also, they all now support Reverse Wireless Charging which the company calls ‘Wireless Power Share.’ Sources claim that it is a 9W charging which means it is way better than Mate 20 Pro’s 2.5W reverse wireless charging. All the phones run on Android Pie out of the box with Samsung’s One UI on top. The 7.9mm Galaxy S10e is the thickest of the three (S10 and S10+ are 7.8mm thick). Since the Galaxy S10+ has the biggest battery, it is heavier than the other two as it weighs 175g. The S10 and S10e are 157g and 150g respectively when it comes to the weight. All three phones are IP68 rated, feature Dolby ATMOS sound & HDR10+ playback. AKG tunes the speakers, and there are AKG headphones included in the box. Finally, talking about the variants and the color options, the Samsung Galaxy S10e is coming in two variants – 6GB +128GB and 8GB + 256GB. The color options for both the variants are Prism White, Prism Green, Prism Black and Canary Yellow. The Samsung Galaxy S10 also comes in two variants i.e, 6GB + 128GB and 8GB + 256GB. The color options are Prism White, Prism Green and Prism Black. The Samsung Galaxy S10+ comes in three variants – 6GB + 128GB, 8GB + 512GB and 12GB + 1TB. So, all the rumors related to a 12GB RAM phone from Samsung with 1TB storage were right. The color options for the 6GB and 8GB variants are Prism White, Prism Black, and Prism Green. When it comes to the 12GB RAM variant, it is coming in two colors – Luxurious Ceramic Black and Luxurious Ceramic White, because it has Ceramic build. 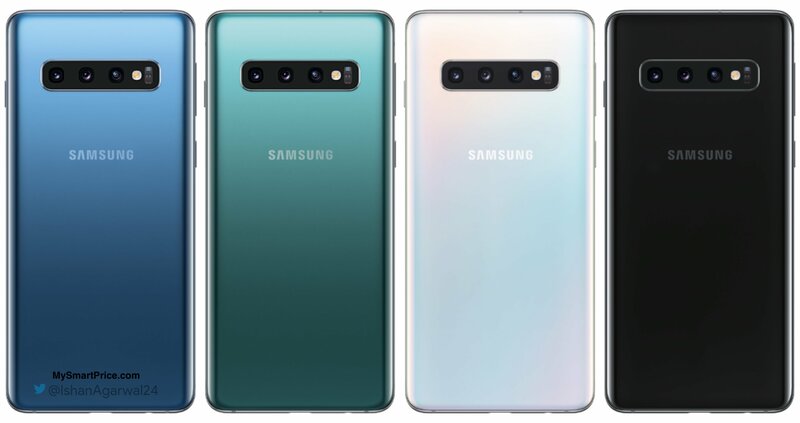 Well, that’s all about the specifications, the color options and the storage options of all the three phones in the Samsung Galaxy S10 family. February 20 is coming, and we will know more about these phones at the official launch event (We don’t think there will be anything left to know).